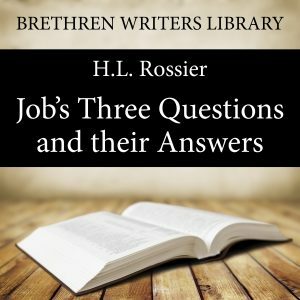 In the book of Job we find the highest and deepest questions, and some of them elucidated in a way far exceeding any other revelations in the Old Testament. It is marvellous to see how in this book all-important questions that man can put in his seeking for forgiveness, and in his searching out the mysterious ways of God are satisfactorily answered. A word about the Author: Dr. Henri L. Rossier (1835 -1928) was born at Vevey in French Switzerland. After studying medicine at Zurich and Wurzburg he settled in his native Vevey, where he lived a long life of devoted self-sacrificing service. At age 27 he married and the Lord in time granted them six children. Along with practicing medicine for well over fifty years, as time went on he increasingly devoted himself to ministering the Word in assemblies and taking part in Bible conferences in Switzerland, Germany, and France. However, it is for his written work that he is best known today – he translated many books into French. Besides this, he wrote commentaries on most of the books of the Bible, especially on the historical and prophetic books of the Old Testament and on the epistles of Paul and Peter and the Revelation in the New Testament. He was a prolific hymn writer as well. The writings of H L Rossier which have been translated into English are available from Believer´s Bookshelf.